The design for this blanket came from a commercial collection that I purchased earlier in the year: "Dakota Collectibles presents Gunold Fashion Heirloom 1000". Dakota was running a special on this collection and, in a moment of weakness, I bought it. It does have the most luscious heirloom designs in it, though .. gorgeous stuff. 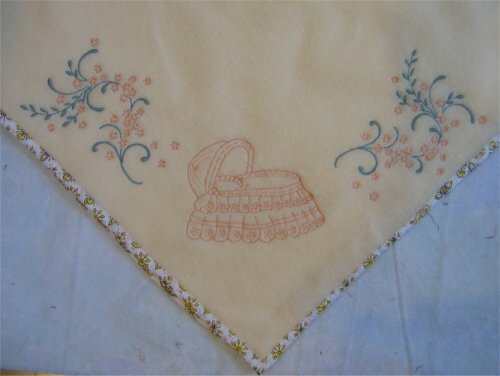 I used two designs from this collection .. a baby bassinet and a floral spray, which was mirrored on either side of the bassinet. Since the baby hadn't been born yet, the name hadn't been decided on, so I elected not to put any name at all. The binding was leftover from another long-ago project. The Learning Experience: using a dry topper on fleece is WONDERFUL! Wow ... this technique really works! By now I was very leery of using my spray baste on the stablizer so I pinned the fleece to it instead. This worked just as well as the spray baste; I will remember this in the future. Spray baste is expensive and if pinning the fabric to the stablizer works just as well, this is an expense I can cut down on. I then cut a piece of Solvy to cover the entire hoop area and pinned it to the fleece and stabilizer. Then I embroidered. What a difference! The completed design looks *wonderful*! All the design elements snuggle right up next to each other as they should, instead of having gaps where the fleece stretched while being stitched. I'm very, very pleased with the results.